I must have refreshed the weather app a thousand times looking for a rain shadow at the crack of dawn while lying in bed. Everywhere east of the Cascades looked equally wet, if not wetter, and with a high chance of afternoon precipitation. Another one of my rainy day slash off-season favorites. In years past we’d enter through the gate immediately after the pavement ends on Buffalo Road. 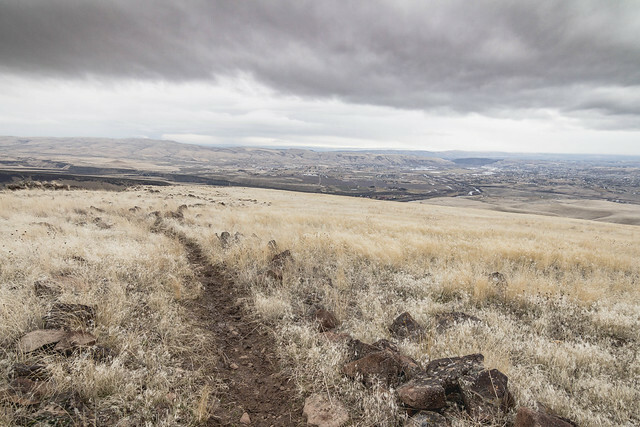 This time, following directions on WTA, I drove an additional 2.2 miles (1.5 miles on the website) on the occasionally muddy dirty road, to the open area above the trailhead and parked there. One year to the date since our last visit, this time minus the snow. Trail made its way toward the rim of the river canyon, then it more or less followed the rim due north to Point 2737 before tapering off for the descent to the saddle on the other side. It got colder and windier with the elevation gain, at one point temperatures even dropped below freezing. Several times it flurried while we were on the rim, but the snow never stuck to the ground. Gracie Point had been capped in clouds for a while, not a whole lot to see after we arrived. It was extremely windy on top, so we stayed just long enough to snap a few photos before heading back down to the trail. 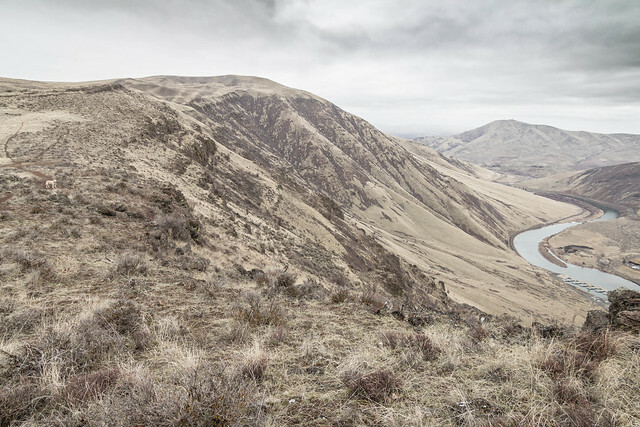 Together with Baldy and Selah Butte, the dramatic landscape with Yakima River winding through the canyon never got old, even after all the times we had visited.